I’ve already written a review of taking children for a day out at Kirklees Light Railway, which had the regular engines from Kirklees Light Railway. Our second visit to the light railway was during a special day out with Thomas weekend, featuring Thomas the Tank Engine and some of his friends. The Kirklees Light Railway holds these events on about 5 weekends in the year with other railways using the engines at other times. We visited on the day of a England game during the 2010 World Cup, which may mean that this was less busy than similar weekends. The day out with Thomas days are more expensive than the normal return tickets, but they include some extras in the price of the tickets. In addition to the trip up the main track each child ticket gets 6 extra tokens marked on the ticket. 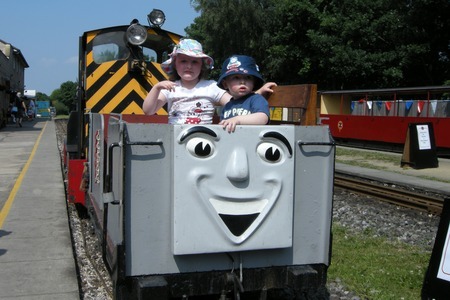 These can be used for other activities including: Platform ride with Mavis and The Troublesome Truck, Short ride in Thomas / Toby train, ride on the sit-on miniature railway, face painting, bouncy castle and donkey rides. There is also a children’s playground at Clayton West and some other activities that are at Shelley (other end of the line) including bouncy castle, playground and a marquee with colouring, games and temporary tattoos. 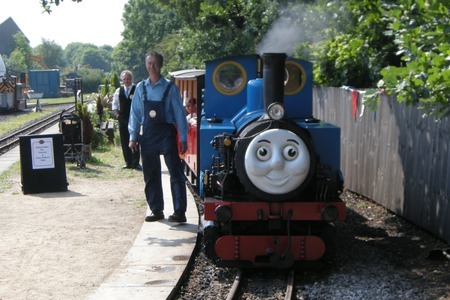 The main train is sometimes pulled by Thomas the Tank Engine, but is normally pulled by Percy or one of the normal KLR engines such as Owl and Fox, which feature a smiley face. For Thomas the Tank Engine fans it’s a great day out, but how does it compare with a day out at Thomasland (Drayton Manor Theme Park)? It’s not really possible to make a direct comparison, but here are a few of the pros for Day out with Thomas at Kirklees Light Railway and Thomasland at Drayton Manor Theme Park. 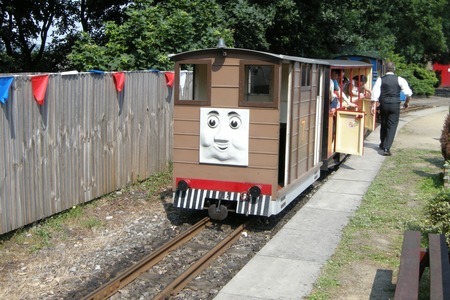 For Thomas the Tank Engine fans both Thomasland and Day out with Thomas are great and kids with love them. 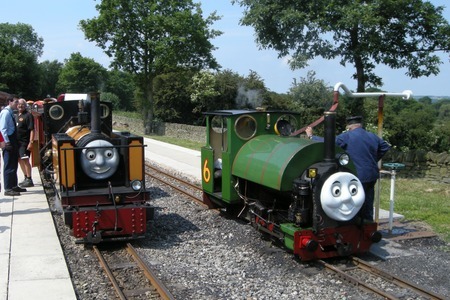 Train enthusiasts will prefer the real steam trains at Kirklees Light Railway, but children will probably prefer the number of rides at Thomasland. My kids love both. Thomasland is normally much more expensive, but there are some good discounts available at certain times and events at Thomasland. This entry was posted on Monday, July 5th, 2010 and is filed under Babies, Children, Days Out. You can follow any responses to this entry through the RSS 2.0 feed. Both comments and pings are currently closed.